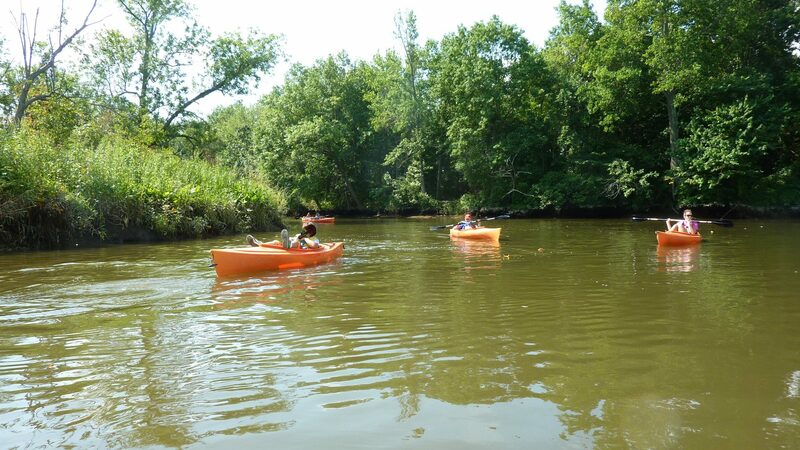 In early August, Delaware Nature Society had a week long camp for 9 – 12 year olds called Kayak Fun and Games. We spent the first two days getting acquainted with each other and with our kayaks at Lums Pond and the Octoraro Reservoir. We practiced kayaking backwards and in circles and playing squirt gun tag. We got good enough to do a synchronized kayak ballet going around bridge supports, which unfortunately I did not video for YouTube fame. On Wednesday, storms were threatening, but we made it to Dragon Run, near Delaware City to explore an impounded fresh water marsh. 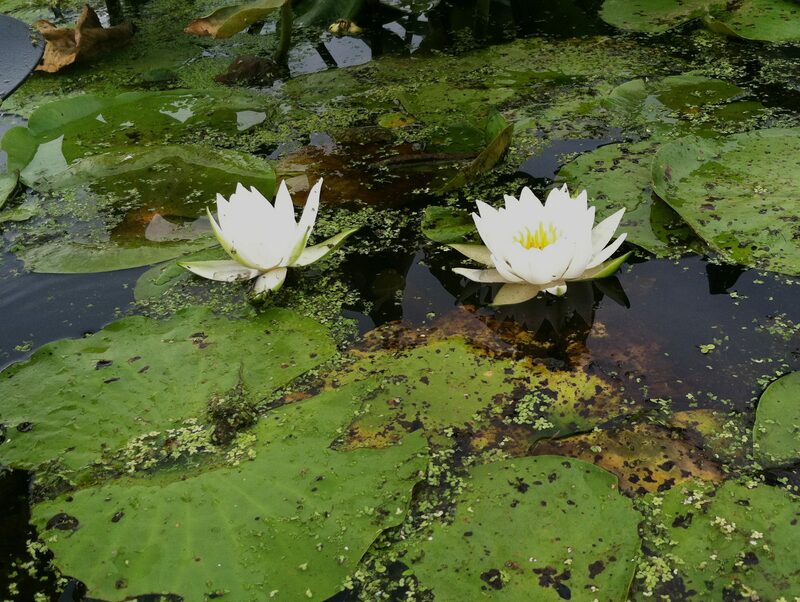 We blazed our way through the vegetation near the end and discovered a fragrant water lily (Nymphaea odorata), which I have never seen there in the past. Kayaking Dragon Run near Delaware City. Fragrant Water Lily at Dragon Run. Fearful that the predicted storms would create flooded conditions on the Brandywine Creek the next day, we went to a private farm on the Chesapeake instead. 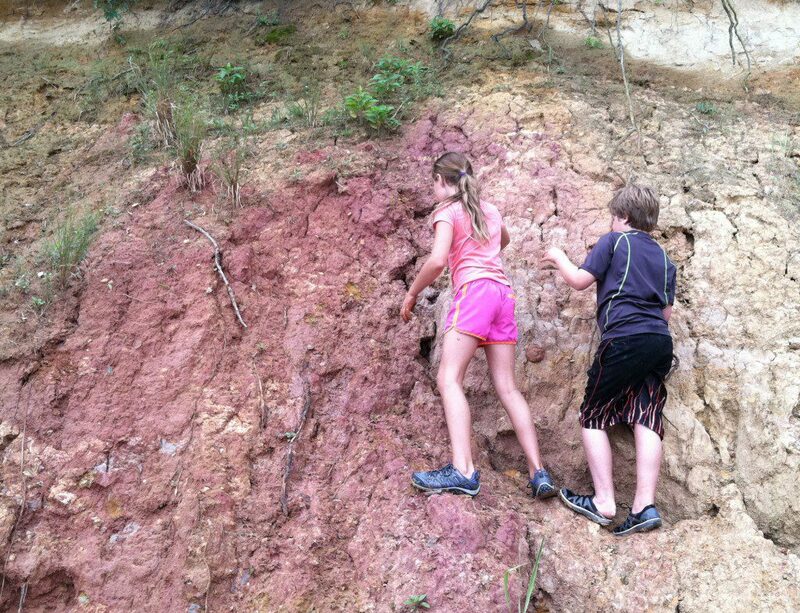 We kayaked around the point at Veasey Cove to a cliff on the Elk River, where we discovered colored clay that could be hand dug. The kids created all sorts of creatures and became all sorts of creatures after painting themselves with the clay! Clay cliff along the Elk River, MD. 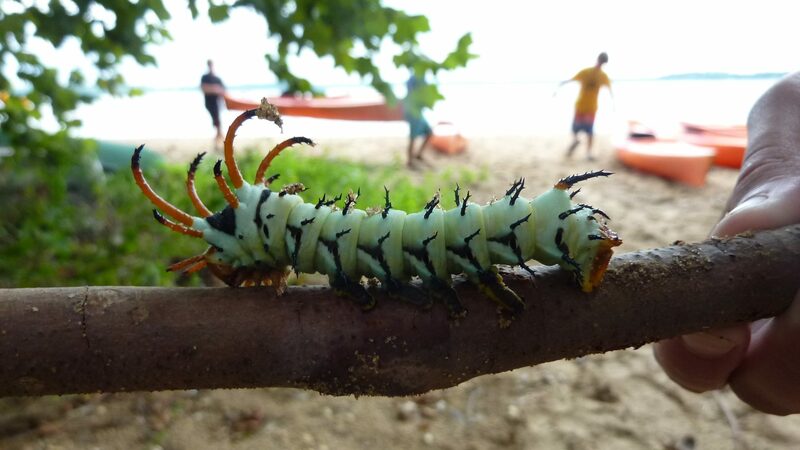 Coming back to the sandy beach in Veasey Cove, we found this amazing caterpillar, (which I am trying to ID – can’t find it in my book, so have sent off to an entomologist friend) as well as many bald eagles. We had two mature eagles in a tree and three flying overhead at the same time. To Sally...From Joe: The caterpillar is a Hickory Horned Devil which turns into a Royal Walnut Moth. Our last day was spent on the tidal Christina River. We paddled against the tide for 1 & 1/2 hours and then spent far less time being carried back with the tidal flow. This part of the Christina is a secret treasure. As we kayaked through a wilderness with nesting barn swallows, turtles, wild rice and spatterdock, and with Russet-tipped Clubtail dragonflies flying around us, we heard the sounds of ice cream trucks and civilization beyond the trees. It was a nice reminder of what can be found in our own back yards. Paddling the placid waters of Dragon Run Marsh. July 31, 2010. Image by Derek Stoner. Grab your favorite paddle and come along with us for a canoe trip to Dragon Run– no life preservers necessary! After driving past the looming bulk of glowing metal towers at the Delaware City petroleum refinery, we hang a hard right on Clarks Corner Road and head south. A mile later and we are at the put-in spot for our canoe adventure. Many hands make light the work of unloading our watercraft, and soon we are underway. 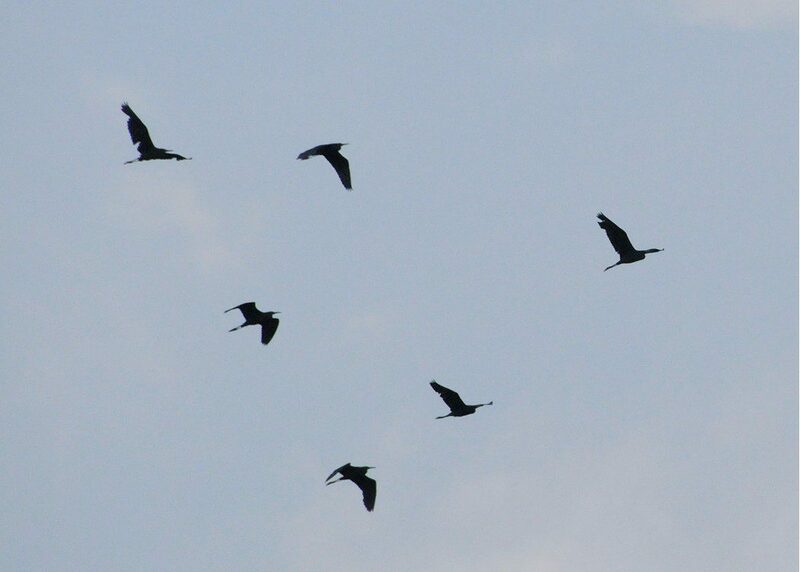 A small flock of Little Blue Herons flies toward their roost on Pea Patch Island. July 31, 2010. Image by Derek Stoner. Dragon Run is a vibrant freshwater marsh that has a narrow channel (run) carved through the dense aquatic vegetation. The vast marsh is connected to the Delaware River one mile from our launching point, and the water flows slowly in an eastward direction. As we paddle along, flocks of wading birds pass overhead: Little Blue Herons, Snowy Egrets, Glossy Ibis, and occassional Great Blue Herons and Great Egrets. These elegant waterbirds are headed to their night-time roost on Pea Patch Island, in the middle of the river just below the Dragon Run outlet. A pink Marsh Mallow glows in the late evening light at Dragon Run. July 31, 2010. Image by Derek Stoner. We are visiting at the best time of year to view the spectacular blooms of aquatic wildflowers: white Lizardtail and Smartweed, purple Pickerelweed, pink Swamp Rose and Water Willow, and Marsh Mallows, a spectacular producer of plate-sized pink and white blooms. 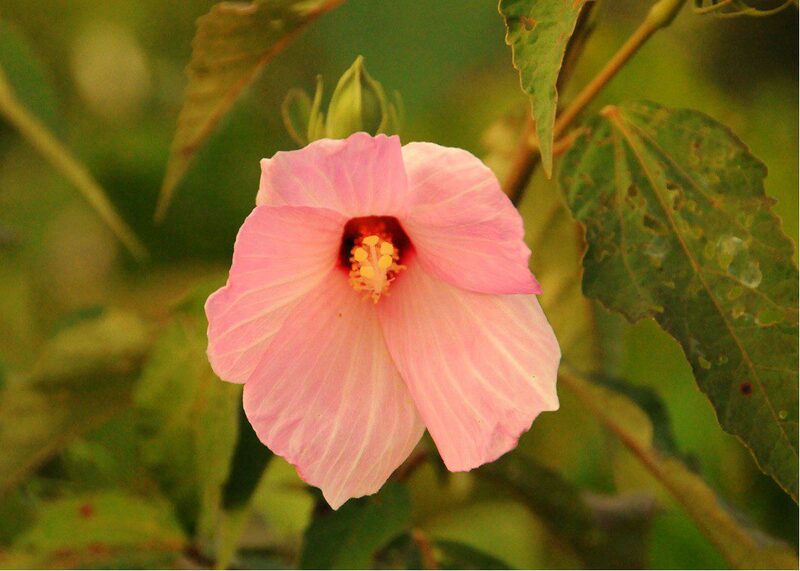 A member of the Hibiscus family, the roots of the Marsh Mallow were utilized by English sweetmeat-makers to prepare a confectionary paste said to be of curative value in treating coughs and hoarseness. The ‘Marshmallows’ sold by confectioners today are the modern equivalent of this recipe (a mixture of flour, gum, and egg albumin), but no longer contain mallow root. 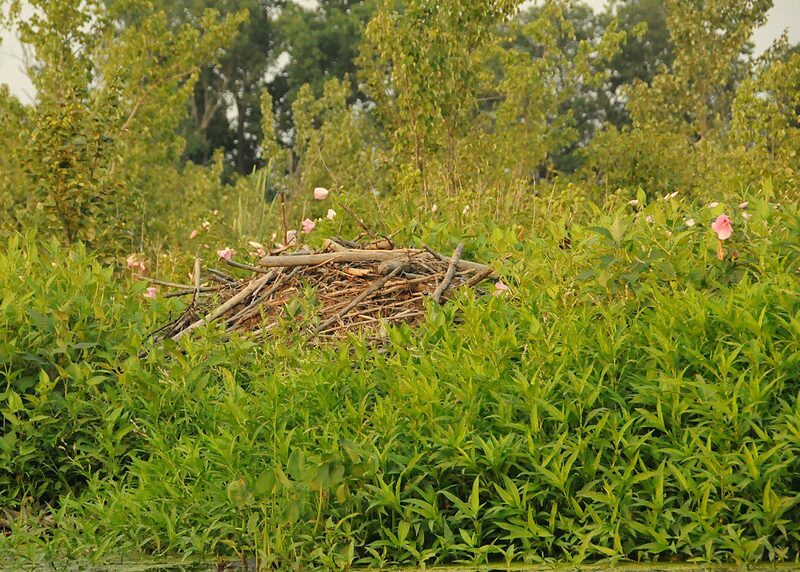 A Beaver lodge sits along Dragon Run, tucked amidst the Marsh Mallows. July 31, 2010. Image by Derek Stoner. Besides the bounty of blooms, we are also hoping to spot another Dragon Run specialty: aquatic mammals! This locale may be the best place to see the trifecta of American Beaver, River Otter and Muskrat, the only truly aquatic freshwater mammals in Delaware. During a paddle of less than a mile, we encounter at least six active beaver lodges, and see the muddy platforms along the edge where the beavers and muskrats sit and chew aquatic vegetation. A few slick “mud slides” are indications that the otters are around and taking advantage of the good fishing here, as bass, bluegill, and pickerel abound. The canoes at the head of the group spot a few muskrats paddling along, and as we round a bend, an enormous beaver raises its tail and slaps the water with a resounding thwack! Since they are not easy to see well in their underwater habitats, any encounter with these unique mammals is always thrilling. An evening paddle at Dragon Run is rewarded with a spectacular sunset. July 31, 2010. Image by Derek Stoner. Towards dusk, we turn the canoes around and head back, into the setting sun. A steady stream of Tree and Barn Swallows fly overhead, and we watch the twisting flight of Wood Ducks as they head to their night-time gathering place. The western sky is lit up in orange and red hues, and the views are spectacular. For the whole trip, we’ve not seen or heard any other humans. Quiet and solitude prevail, and the sense of being in a wild area is real. Tucked away in a corner of bustling New Castle County, in the shadow of a major industrial plant, the delightful Dragon Run always manages to surprise and delight the visitors to her waters. 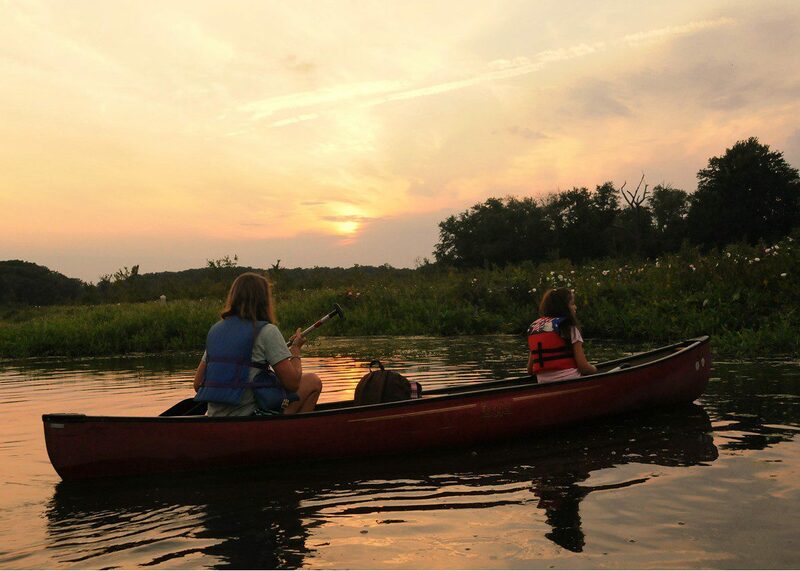 The Delaware Nature Society is leading another canoe trip meandering through the Dragon Run but under the light of August’s full moon! Tuesday, August 24, leaving Ashland at 6:30; members can register on-line, non-members (can join on-line) or call in to sign up (239-2334.) No canoeing experience is necessary. 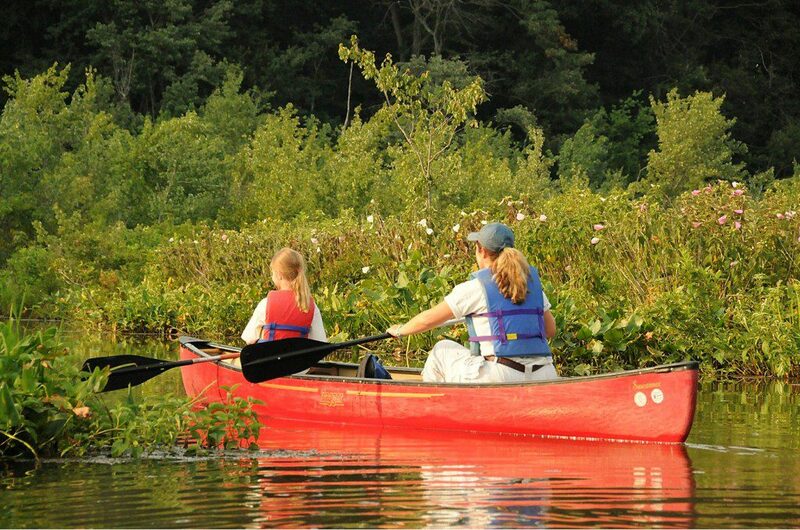 Listen to the sounds of nature while enjoying the unique experience of nighttime canoeing! A leg-banded drake Wood Duck at Dragon Run Marsh. Photo by Hank Davis. 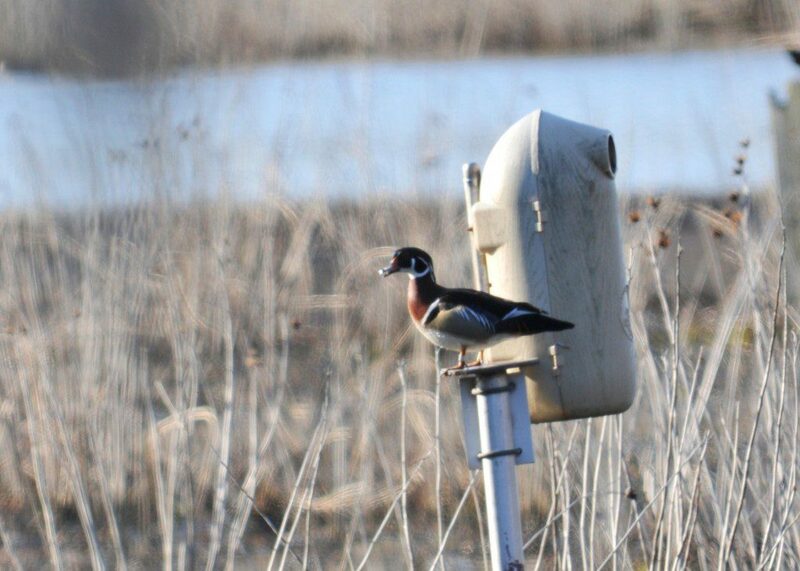 When the first stop on a waterfowl watching trip produces great looks at newly-arrived Wood Ducks perching on nest boxes, you know it’s going to be a good day. When you notice that the drake Wood Duck is leg-banded(wearing jewelry! ), you know it may be an extra-special day afield. On the Delaware Duck Day trip, our goal is to find as many species of waterfowl as possible. Ducks, geese, and swans are counted as true waterfowl, but we also enjoy observing “honorary” waterfowl like loons, grebes, and rails. 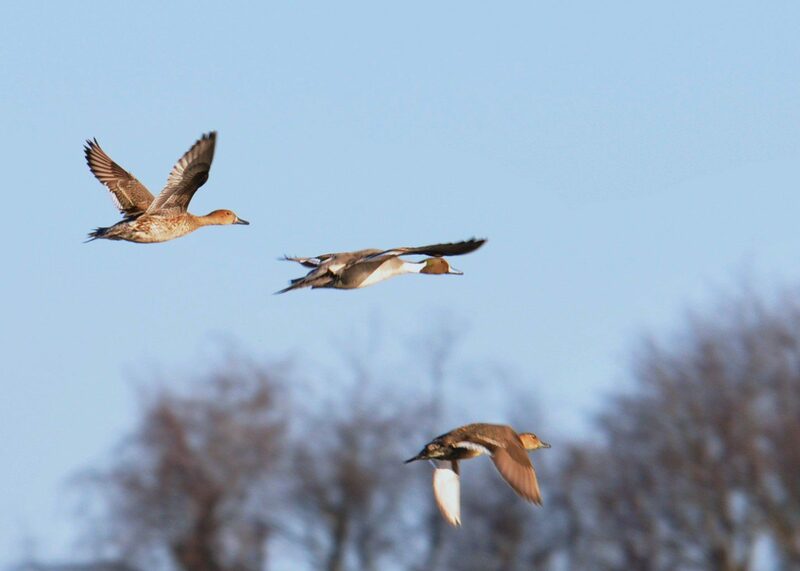 The graceful Northern Pintail in flight at Thousand Acre Marsh. Photo by Derek Stoner. After excellent looks at Dragon Run Marsh at ducks like Green-winged Teal, American Wigeon, Gadwall, Ring-necked Duck, and Northern Shoveler, we crossed the C&D Canal to the legendary Thousand Acre Marsh. The marsh seemed to be carpeted with at least 100 Northern Pintails per acre, with these elegant ducks parading about in their breeding finery. A Bald Eagle on a nest, and a pair of feisty Peregrine Falcons added to the great sights. 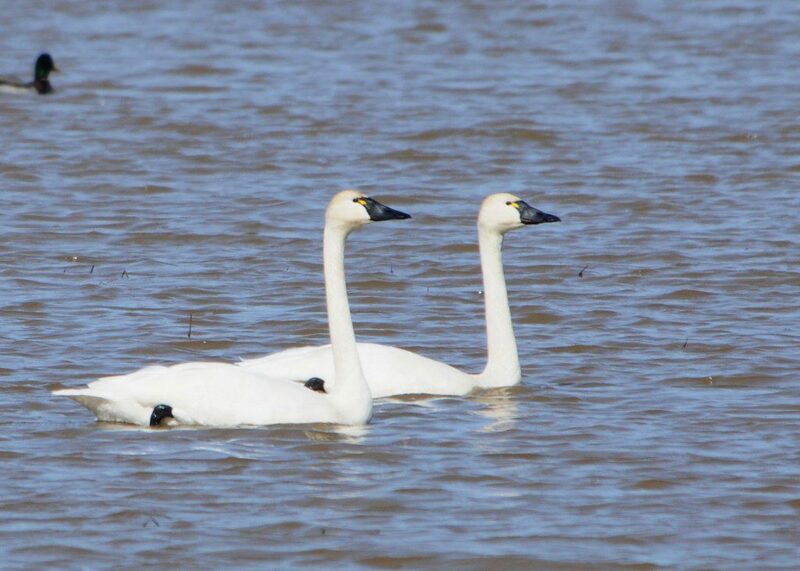 A mated pair of Tundra Swans, the image of grace and beauty. Photo by Derek Stoner. We stopped at Little Creek Wildlife Area, where diligent work with a spotting scope revealed a drake Eurasian Wigeon and drake Redhead, both rare and beautiful birds. Tundra Swans, Ruddy Ducks, and Common Mergansers filled the water under a sky that held circling Bald Eagles, Red-shouldered Hawks, and Cooper’s Hawks. A drake and hen Long-tailed Duck bob in the surf at Indian River Inlet. Photo by Hank Davis. The spectacle at the Indian River Inlet, where the ocean meets the bay, left us speechless. 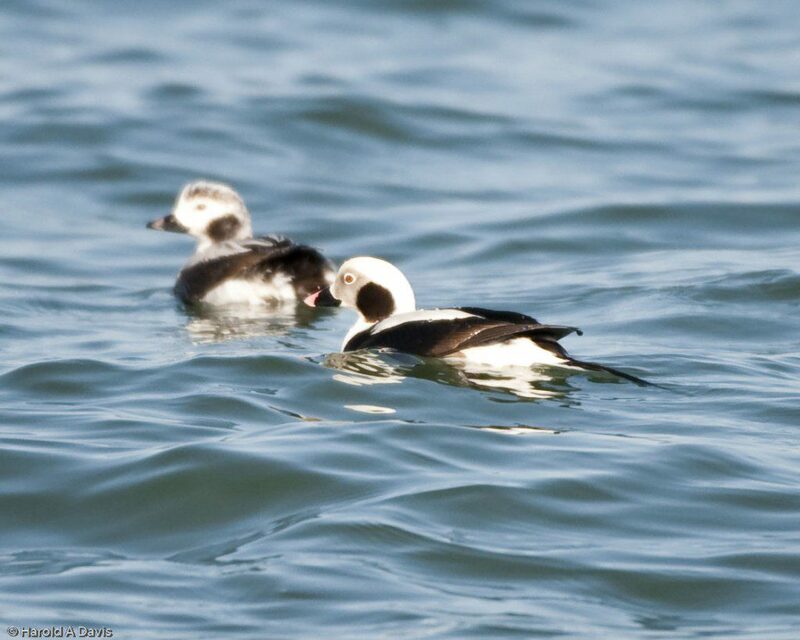 Digital cameras clicked away as we took in the expanse of water covered with Long-tailed Ducks, Black and Surf Scoters, and Red-throated and Common Loons. Purple Sandpipers, Dunlins, and Sanderlings hopped about the algae-slick rock jetty, as they bathed and preened in a puddle. A nearby vantage point overlooking Rehoboth Bay gave us looks at Red-breasted Merganser, Bufflehead, Brant, and distant Common Goldeneye. A drake, or bull, Canvasback sails across the glassy waters of Silver Lake. Photo by Derek Stoner. No waterfowl trip in Delaware is complete without a stop at Silver Lake in Rehoboth, and we enjoyed excellent close looks at Canvasbacks, Black Ducks and the ubiquitous Mallards. Ruddy Ducks just coming into breeding plumage bobbed with their stiff tails pointed skyward. We completed our day with a stop at the wildlife-rich Prime Hook NWR, where a purple-pink sunset and a clamoring flock of Snow Geese and pintails helped cap off our day afield. With 26 species of waterfowl observed and great warm weather, we’d had a ducky day! 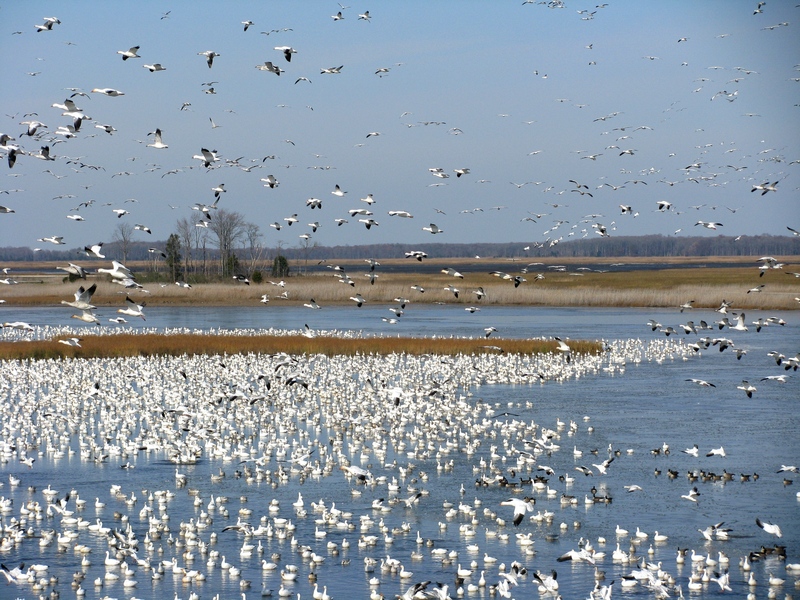 Swarms of Snow Geese swirl into Raymond Pool at Bombay Hook NWR. Delaware is fortunate to have a wealth of waterfowl and wetlands. 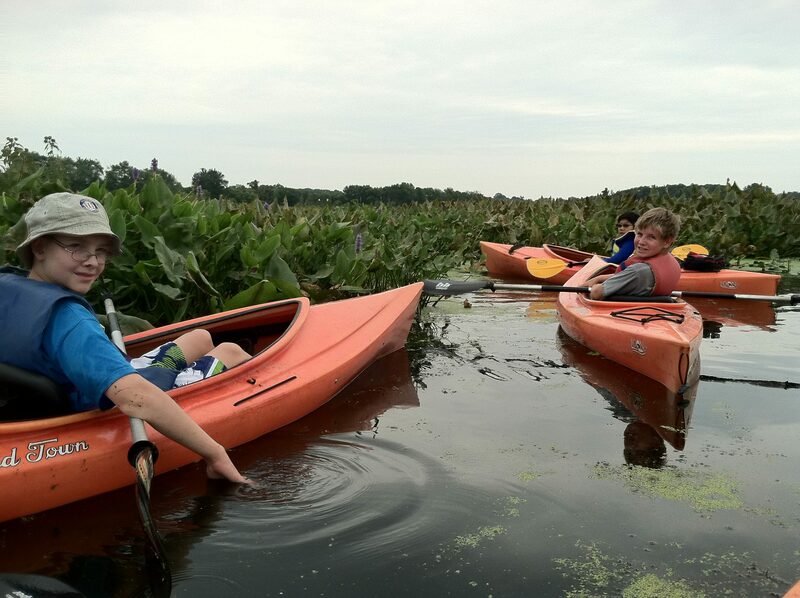 The Young Waterfowlers class, an in-depth course offered each fall by the Delaware Nature Society and Red Clay Valley Association, introduces youth to waterfowl, wetlands, and the waterfowling tradition. There are 27 students taking the course this fall, ranging in age from 11 to 16. Young Waterfowlers students and parents scan for waterfowl at Dragon Run Marsh. 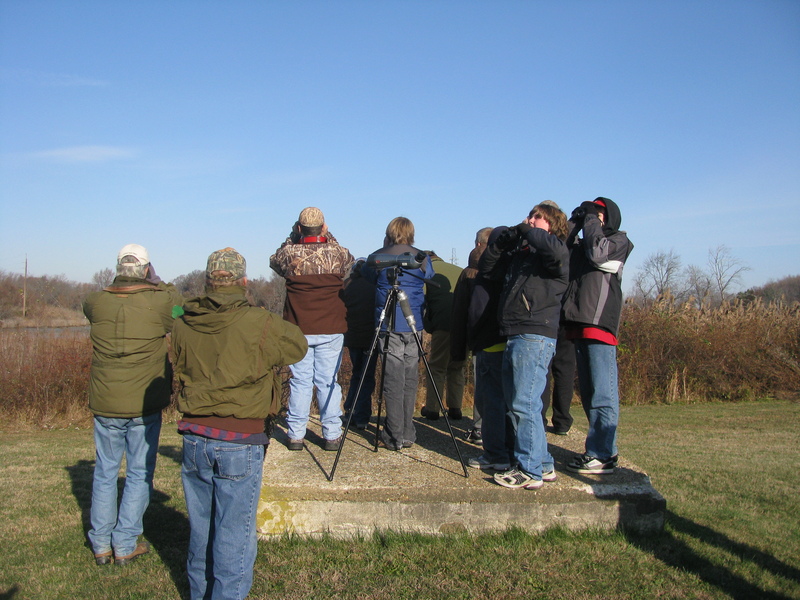 On Sunday, we headed afield for our annual Waterfowl Identification Field Trip. Jim White, Associate Director of Land and Biodiversity, co-led the trip. Jim’s son is a second-year student in the class. At Dragon Run Marsh, a rich freshwater marsh outside Delaware City, all the birds concentrated in an open patch of water amidst the ice. Gadwalls, Northern Shovelers, and Mallards crowded together in the frigid water. 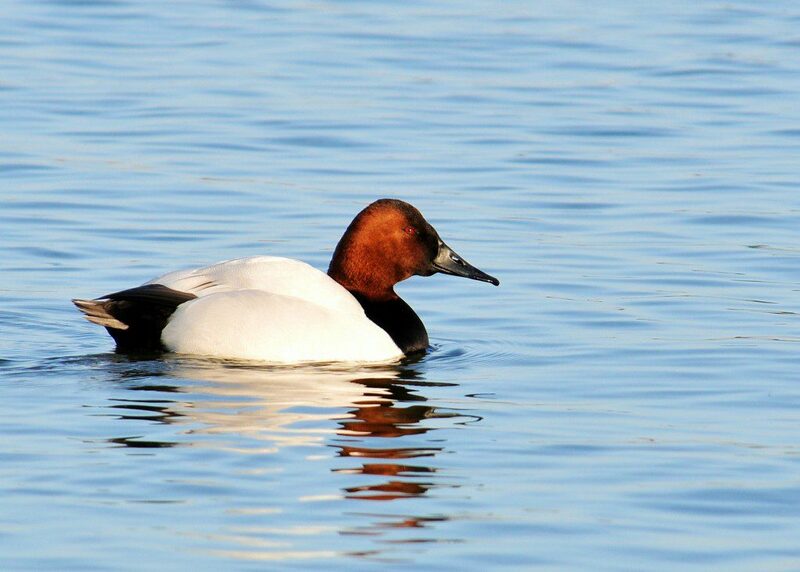 Gracing the flock with a splash of color was a drake Redhead, a gorgeous duck with a rusty head and bright blue beak. 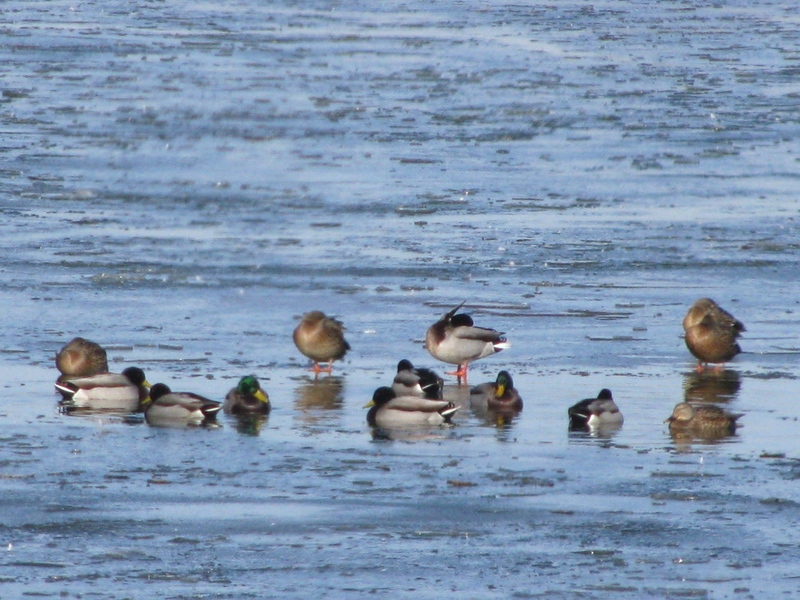 A flock of Mallards(and a couple Black Ducks) rest on an icy pond. Waterfowl are incredibly hardy. They are actually able to restrict blood flow to their feet when standing on ice, so their blood does not chill. Cold weather is no deterrent to these birds! Using dip nets, Young Waterfowlers search for aquatic life in a brackish pond at Woodland Beach Wildlife Area. On our trip, we learned more about wetlands by visiting a marsh and pond. With nets in hand, students captured Banded Killifish, Mummichogs, Atlantic Silversides, and Grass Shrimp. 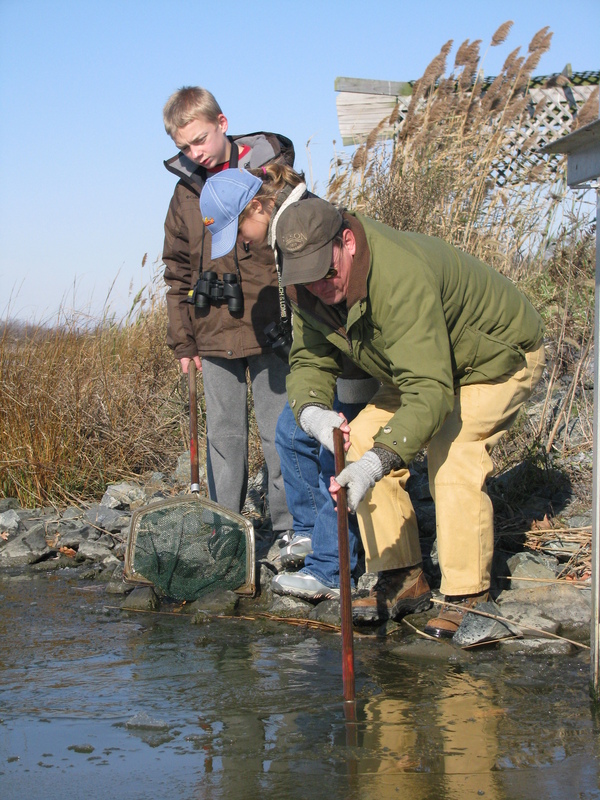 The Young Waterfowlers course offers plenty of hands-on activities: carving duck decoys, practicing duck and goose calls, and visiting important waterfowl areas like Bombay Hook National Wildlife Refuge. 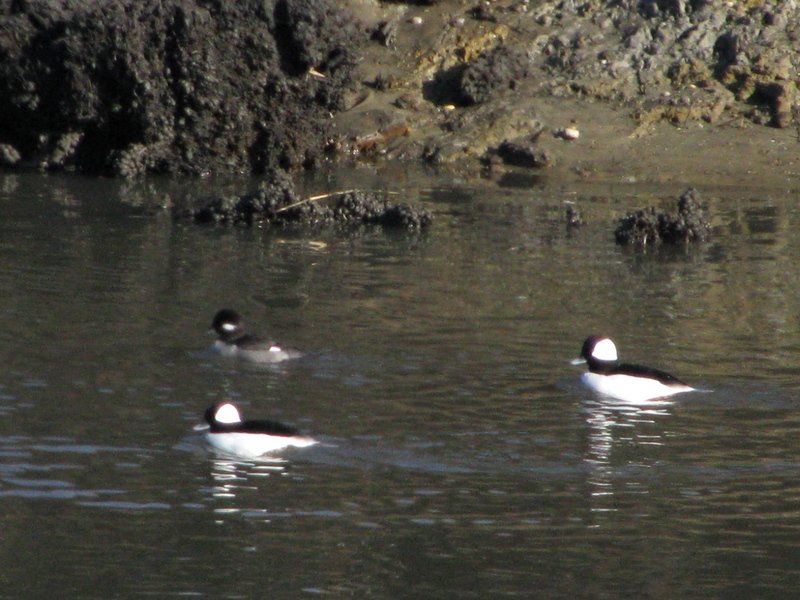 Buffleheads(two drakes and a hen) swim in a tidal creek at Bombay Hook NWR. For the day, Young Waterfowlers witnessed tens of thousands of Snow Geese, saw Buffleheads bobbing in a tidal creek, and heard the quirky quacks of Gadwall. Our final field trip of the season provided a memorable experience for all.